The SQUARE POS Bundle is ideal for Juice Shops, Bubble Tea Shops and Coffee Shops. It comes with a state of the art Star Micronics Eco Thermal Printer, Epsilont Steel Locked Cash Drawer and a Square iPad Stand (iPad not included). You can start accepting credit cards or cash right away with the easy to setup SQUARE integration. The Star Micronics Eco Thermal Printer uses ink-less (thermal) printing so you will never have to spend money on expensive inks. The TSP100ECO electronics has been designed with an advanced power management circuitry which allows any user to reduce his printer current consumption by up to 75% compared to standard Star printers. Developed with smart paper management features, the TSP100ECO is designed to minimize the environmental impact of point of sale printing. 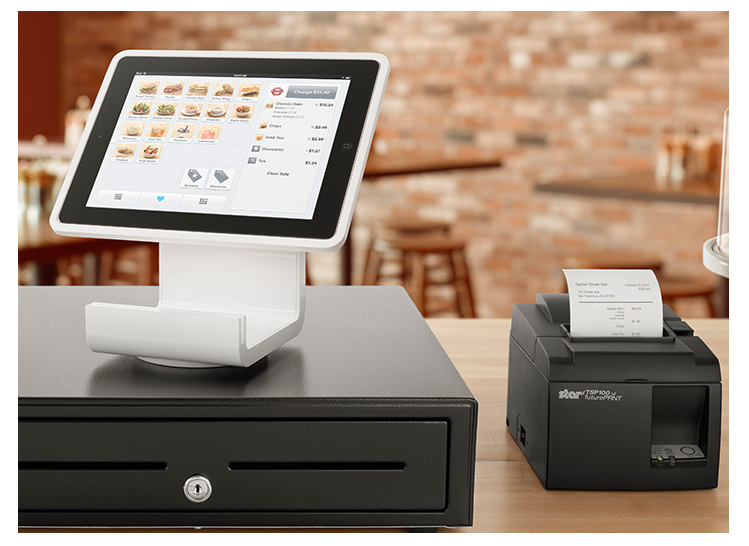 Attach hardware instantly – Square stand comes allows you to easily add a receipt printer, cash drawer, bar Code scanner, and the Square contact less and chip reader.